Join American Hauntings for a night that you won't soon forget -- a search for the ghosts of the old 1859 Jail and Marshal's Home in Independence, Missouri, made famous during the bloody days of the Civil War in Missouri by guerrilla fighters like William Quantrill and Frank James. Spend the night looking for the ghosts of this historic -- and very haunted -- old jail with a limited number of ghost hunters during a private ghost hunt. Find out if the place is really as haunted as so many people claim and perhaps come face to face with one of the former occupants of the place! The Jackson County Jail and Marshal's house was built in Independence, Missouri in 1859 and was used until 1933. It was close quarters for the marshal and his family, who lived on site. His wife cooked for the prisoners, helping her husband earn his $50 per month salary. The jail itself was built from two-foot-thick limestone and had 12 cells, lit by a single kerosene lamp in the hallway. The cells were not heated and were stifling in the summer. Each was meant to hold only three men, but during the Civil War, as many as 20 men could be packed into the narrow chambers. It was during the war that the jail became infamous. It held both military and civilian prisoners and probably the most notorious inmate – for a short time – was Confederate guerilla leader William Clark Quantrill. He gained his real infamy in August 1863 after Union officials in Lawrence, Kansas ordered the detention of any civilians giving aid to Quantrill's men, who included "Bloody Bill" Anderson, the Younger Brothers and Frank and Jesse James. Several female relatives of the guerillas were imprisoned in a makeshift jail in Kansas City and on August 14, the building collapsed, killing one of Bill Anderson's sisters and crippling another. Quantrill's men believed the collapse was deliberate and raided Lawrence, Kansas, killing 183 men and boys and burning most of the city. The town was looted and the bank was robbed. Union officials retaliated, forcing tens and thousands of civilians out of their homes along the Missouri-Kansas border. Federal troops marched through behind them, burning buildings, torching planted fields, and shooting down livestock to deprive the guerrillas of food and support. The area was so thoroughly devastated that it became known thereafter as the "Burnt District." Jackson County was one of those affected by the order and scores of women and children were detained within the walls of the jail – held without charges or a trial. After the war, the jail's most famous inmate was Frank James, older brother to outlaw Jesse James, who spent almost six months behind bars there in the 1880s. During his time at the jail, James' cell was furnished with a Brussels carpet, fine furniture and paintings, and he was permitted free run of the jail and hosted card games in his cell at night. Frank James' cell is preserved as it was when he occupied it and can still be seen today. In the 1900s, the jail was used to house the prison chain gangs that were used to improve the local roads, a brutal, hot and exhausting punishment that broke the men's minds and bodies. In 1933, the last jail hung up his keys and the county found a use for the jail and home when it housed several offices, work training programs and government bureaus during the Great Depression. Join us now as we unlock the history and search for the lingering spirits of those who were jailed and died here over the years. 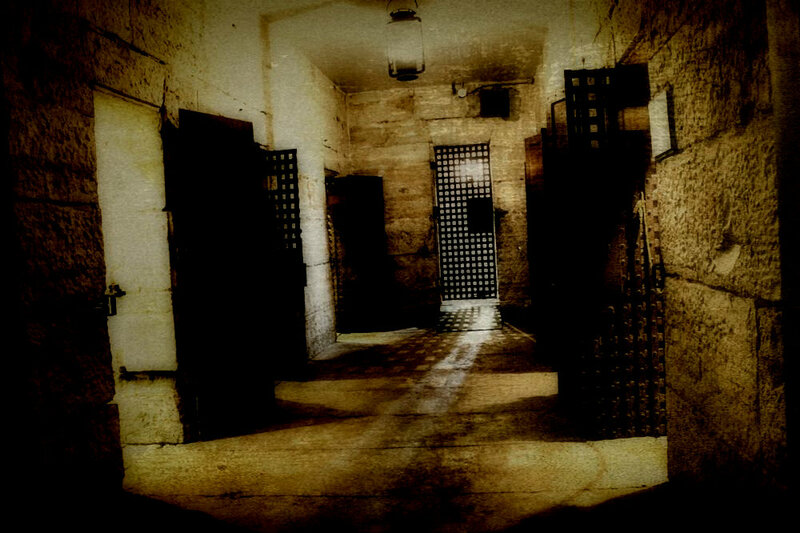 Discover the criminals and ordinary people who were incarcerated behind these walls perhaps come face to face with a presence of yesterday with American Hauntings!